Where can I go to see hang gliders fly? 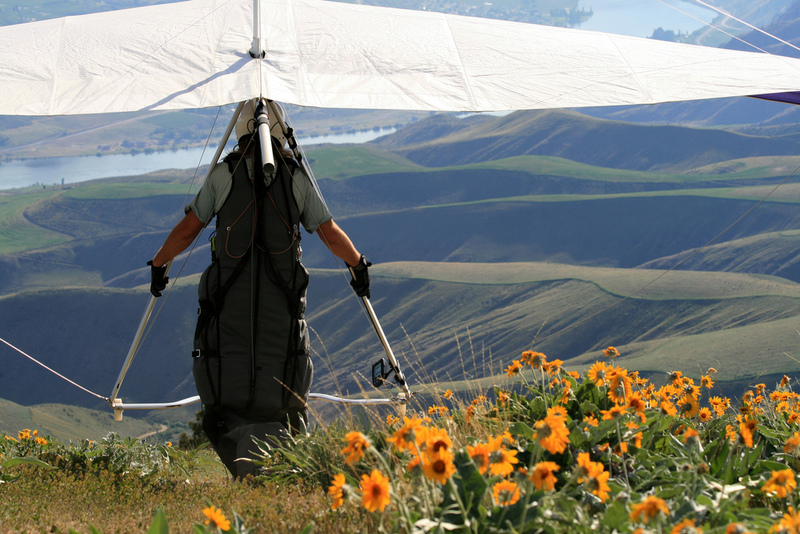 Check the site guide section of this website to find Dog Mt., Chelan, and Blanchard, the most likely sites where hang gliders will be flying on any weekend with decent weather conditions. The calendar section has planned fly-ins and competitions, always an excellent opportunity to watch the action, and perhaps even take a tandem discovery flight with a qualified tandem instructor. How can I find out if I’m going to like flying a hang glider, before I commit to lessons? Come watch pilots fly, spend some time up on launch or in the landing zone, talk to the pilots, try to schedule a tandem discovery flight. Be forewarned: The love of flight is contagious – hang around pilots long enough, and you’ll be hooked! A hang gliding country club?? Is membership exclusive, and dues expensive? Cloudbase Country Club (CBCC) membership is open to anyone interested in hang gliding, whether as a pilot, a driver, a photographer, or just because. Dues are $30/year. Currently we have about 80 members. A hang glider can be foot launched from a hill or cliff, or towed behind plane. Most flights remain below 1350 – 1800 meters (4000 – 6,000 feet). The real limitation is the pilot: Above 3,000 – 4000 meters (10,000 – 13,000 feet) you will need oxygen. Where can hang gliders launch and land? Hang glider pilots appreciate a bit of a slope and an upslope breeze to assist the run that brings the glider to flying speed; how much slope and breeze is needed depends on the pilot’s running ability and the performance requirements of the glider. Beginner gliders are easy to launch – even flat-slope, no-wind launches are possible – while high-performance (advanced) wings demand better conditions and stronger skills. It’s also possible to get airborne by towing behind an ultralight aircraft, or from a truck or stationary winch. Before launching, the pilot will make certain that there’s a reasonable landing zone within glide, “reasonable” meaning relatively flat, free from obstructions such as trees and fences and powerlines, and large enough to accommodate the skill level of the pilot and the performance level of the glider (high performance gliders tend to glide a long ways and require a longer field; beginner gliders are not likely to over-glide a reasonable-sized LZ). How safe is climbing a ladder and venturing out on your roof to clean the skylights? Any activity that puts you far above the ground is inherently dangerous. That being said, many hang glider pilots fly for decades without injury. Pilots who make good choices regarding quality of instruction, the equipment they fly, the sites they choose and the weather that they deem acceptable for flying are likely to remain injury-free. However, accidents do happen. There are rarely more than 10 fatalities, typically fewer than 5, in the entire US in any given year. Do you need a lot of wind to fly a hang glider? Launches and landings are easier with wind, as long as it’s coming from the right direction (straight in the pilot’s face) and not too strong or turbulent. Most pilots prefer wind between 5 and 20 mph for comfortable flying. Wind that is too strong may make it difficult to control the glider on launch or, if the wind is faster than the glider’s flying speed, may make it impossible to fly forward and reach the LZ. Gravity acts on a hang glider just like on everything else, so the glider is always “falling” relative to the parcel of air it’s in. Hang glider pilots search for areas of “lift,” where the parcel of air they’re in is rising faster away from the earth than the wing is falling toward it. Ridge lift occurs when horizontal wind hits an obstruction (like a ridge, for instance) and is deflected upward. Thermal lift occurs when terrain is heated by the sun and transfers this heat to the surrounding air, which then rises. Pilots flying in ridge lift get up by cruising back and forth through the band of lift in front of the ridge. Thermals usually develop above some “trigger point” on the ground and then rise as a column or bubble of air. When a pilot encounters a thermal, he or she will fly in a circle in this region of rising air, climbing in exactly the same way as hawks and other soaring birds climb out by circling in thermals. As with so much else in hang gliding, “that depends.” Pilots who expect to gain altitude need to know how the temperature of the air changes with elevation (typically a drop of 4°F for each 1000′ gained, but that can vary). It’s not unusual to see pilots at a thermal site in the summer dressing for winter temperatures, even though it’s brutally hot on launch. Do you have to be in really good shape to fly a hang glider? Can women do it? 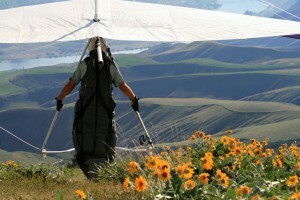 Flying the glider is not physically demanding – the pilot hangs in a comfortable, sleeping-bag-like harness and needs only to shift his or her weight slightly for and aft, and left to right, to control the glider’s speed and direction of travel. Launching requires the ability to hold and balance the glider, which weighs from 40 to 80 pounds, while running the several steps needed to get airborne. Just about anyone who has the will to learn to fly can do so. Since flying depends more on balance and endurance than on brute strength, woman and men make equally good pilots. While the fraction varies regionally, about 10-15% of the hang glider pilots in the US are women. Are there age requirements for being a pilot? Hang glider pilots range in age from teens to octogenarians. The limits are more mental than physical. Anyone who’s sufficiently mature to make decisions about factors significantly affecting his or her safety and has sufficiently good reflexes to act on such decisions promptly is of a reasonable age for flying. What about pilot size – height and weight? While pilots of just about any size can fly, some limits are set by the availability of appropriate equipment. Heavier pilots need larger gliders than lighter pilots. Most hang glider pilots weigh between 90 and 250 lbs., so manufacturers design gliders to fit that span. Being too light on a glider makes control difficult; being too heavy makes it difficult to soar (stay up in lift), and may cause the glider to fly uncomfortably or dangerously fast. Height is not an issue except for very short pilots, who may have difficulty lifting the glider high enough to clear the ground while launching. In the US, no, although some other countries require their hang glider pilots to obtain a license to fly. Most US pilots obtain a “rating” through a program that is administered by the USHPA (US Hang Gliding & Paragliding Association). To obtain a rating (Beginner through Master) a pilot must demonstrate proficiency in a specific set of flying skills; each rating carries a set of recommended operating limitations. Beginner-rated pilots, for instance, should only fly from hills under 100 ft. in height in mild winds and under the guidance of an instructor. While these ratings don’t carry the force of law in quite the same way as FAA pilot licenses do, the majority of flying sites in the US require that hang glider pilots hold some specific USHPA rating to be allowed to fly at that site. How does a student go about learning to fly? The USHPA certifies hang gliding instructors and schools. All students should learn from a certified instructor. There’s a list of all the certified schools in the US on the USHPA website, http://ushpa.aero/schools.asp. Learning to fly a hang glider requires a commitment of both time and motivation. Since hang gliding is a weather-dependent sport, it may take a couple of months to a year or more for a student to progress through the five to ten lessons needed to master the skills required for a Beginner and Novice ratings. With Novice skills, a student pilot will feel comfortable flying from moderate altitudes (several hundred to a few thousand feet above the ground) in mild conditions. Progression to higher ratings (Intermediate and Advanced) with skills to fly in more challenging conditions typically continues under the supervision of more experienced pilots or Observers/Advanced Instructors. Since it’s never a good idea to fly alone, whatever your skill level, most Novice pilots buddy up with a group of advanced and advancing pilots who fly together whenever the weather cooperates. If a student goes to a certified school in a large urban area and buys all new equipment at retail prices, learning to fly can cost $5000 or more. If one purchases used equipment, however, this price can easily drop to around $2000. Keep in mind that flying a hang glider puts the pilot far enough above the ground to make any fall painful or even fatal. Trying to economize on instruction or equipment costs is way too risky; ALWAYS get qualified instruction, and have a knowledgeable instructor or experienced pilot inspect any used gear before you purchase it. For more information on almost everything hang-gliding related in the US, go to http://ushpa.aero/.